Suspicious Heuristics: Are Twitter Lists another social network? Twitter has a "List" feature, which allows users to organize their followers, or view tweets from only a select group. Until recently, the number of lists following each Twitter account was visible on that person's homepage, but that changed in the most recent overhaul of the Twitter interface. Lists are now much less visible in the average Twitter user's experience. 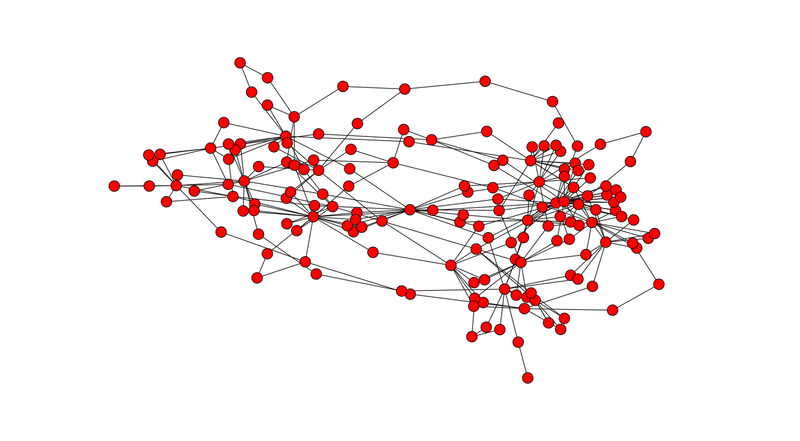 This leads me to wonder, do Twitter lists follow the pattern of other social networks? Did the change even make any difference? With NetworkX and some fiddling around on the Twitter API, I was able to answer that question. To start, I made a queue of everyone who lists me on Twitter (77 in total). Then I had my script go to each of those accounts, collect all the lists they have, and add everyone they have in a list as an edge in my graph. 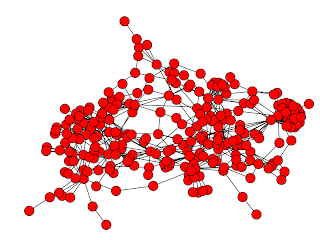 Dots are Twitter accounts, lines show which accounts have each other in lists. Not very edifying. 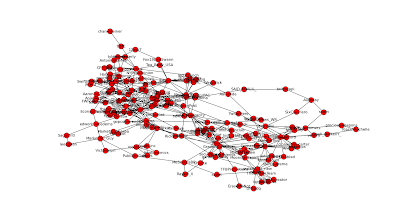 As you may be able to see, there are clusters (one on the left, one on the right) where two accounts list lots of the same people but aren't strongly connected with anyone else. After a little investigation, I found these accounts had very similar names and were very likely being run by the same person/program. So, it looks like there are two separate clusters of nodes, with a few tenuous connections in between. What can we say about the different members of this network? 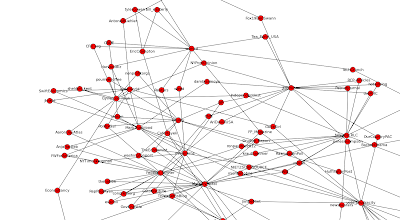 It's hard to display visually here, but I looked at the names of accounts in the graph above. A clear topical split became apparent. On the right are promotional accounts, which are densely clustered and list each other frequently (I'm guessing many of these are automated). On the left side of the graph are economists, news outlets, and political figures. Some economists appearing are: Tyler Cowen, Dambisa Moyo, Paul Krugman, and Bill Easterly; news outlets: The Economist, Washington Post, The Nation, and NY Post Opinion; as well as accounts for politicians such as Paul Ryan, Chris Christie, and Ron Paul. 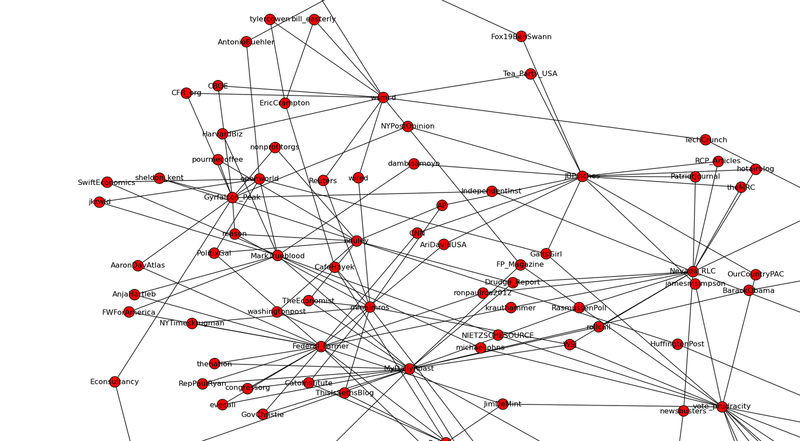 Toward the center of the graph are "neutral" news outlets like TechCrunch, and the left-leaning (Huffington Post, Barack Obama). 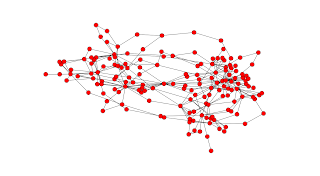 They are connected to the right-wing tweeters through mainstream news outlets like Roll Call and Rasmussen Poll, but have almost no direct connections with those accounts. Zooming in on the "news and economics" segment (click to enlarge). Since these are drawn from who listed me, the selection here says more about my Twitter account than the site more generally. But, I still find it interesting because almost none of the news/politics accounts above were in the original sample of accounts listing me. I'd infer that the ones shown represent common interests of people likely to list me. For the curious: the full version with names. More generally, this shows that lists on Twitter are segregated heavily by interests. This isn't surprising, as that is the list function's intended purpose, and it seems people are using it toward that end. Whether the interest is news and politics, or just gaining more followers, the pattern of listings on Twitter does seem to reflect a spontaneously organizing social network.